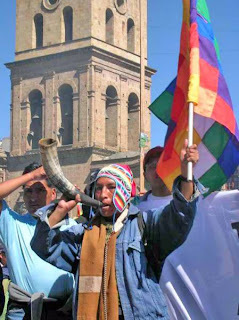 In April 2010 more than 35,000 people from 140 countries gathered in Cochabamba, Bolivia and developed the historic Cochabamba People's Agreement a consensus-based document reflecting substantive solutions to the climate crisis. We, the undersigned organizations, both participated in and/or supported this historic process. Reflecting the voices of global civil society and the agreements reached in 17 working groups, the Plurinational State of Bolivia made an official proposal, comprised of the core components of the Cochabamba People's Agreement, to the Ad Hoc Working Group on Long-term Cooperative Action (AWG-LCA) under the United Nations Framework Convention on Climate Change (UNFCCC). Since then, the accord has gained support and recognition by various nations and regional bodies including ALBA (Bolivarian Alliance of Our Americas) and UNASUR (Union of South American Nations). We are therefore deeply concerned that the new text proposed in the AWG-LCA as a basis for climate change negotiations does not reflect any of the main conclusions reached in Cochabamba. The Chair and the Vice Chair of the AWG-LCA (from Zimbabwe and the United States respectively) have instead incorporated all of the proposals of the Copenhagen Accord, which does not even have the consensus of the United Nations. We urge the UNFCCC to embrace the conclusions reached by social movements, indigenous peoples and international civil society in Cochabamba. It is both undemocratic and non-transparent to exclude particular proposals from the negotiations, and it is imperative that the United Nations listens to the global community on this issue critical to humanity. 1. A 50% reduction of domestic greenhouse gas emissions by developed countries for the period 2013-2017 under the Kyoto Protocol, domestically and without reliance on market mechanisms. 2. The objective of stabilizing greenhouse gas concentrations at 300ppm. 4. The obligation of developed countries to honor their climate debt toward developing countries and our Mother Earth. 6. The creation of a mechanism for the integral management and conservation of forests that, unlike REDD-plus, respects the sovereignty of states, guarantees the rights and participation of indigenous peoples and forest dependent communities, and is not based on the carbon market regime. 7. The implementation of measures for recognizing the rights of Indigenous peoples must be secured in accordance with the United Nations Declaration on the Rights of Indigenous Peoples and applicable universal human rights instruments and agreements. This includes respect for the knowledge and rights of indigenous peoples; their rights to lands, territories and resources, and their full and effective participation, with their free, prior and informed consent. 8. The incentivizing of models of agricultural production that are environmentally sustainable and that guarantee food sovereignty and the rights of indigenous peoples and small-scale farmers. 9. The protection and recognition of the rights and needs of forced climate migrants. 11. The consideration of a World Referendum on Climate Change that allows the people to decide what will be done about this issue, which is of vital importance to the future of humanity and Mother Earth. We demand that the conclusions established by the World People's Conference on Climate Change and the Rights of Mother Earth, which protect life and Mother Earth, be incorporated into the negotiating text during the negotiations in Bonn, Germany, from May 31st to June 11th, 2010. There cannot be an equitable, transparent, and inclusive negotiation process, nor true solutions to the urgency of the climate crisis, if the AWG-LCA negotiating text ignores the voices of the peoples of the world that the negotiators should be representing.